Captain Henry Buckett of Ryde Fire Brigade passed away on 3 June 1896 aged 56. Henry was born in Brixton (Brighstone) in 1840, son of James a fisherman and Sarah. His father, something of a rogue at one time, later became a hero coxswain of the lifeboats, risking his life to save several lives of others and perhaps this inspired Henry's future undertakings. The census of 1861 shows that Henry, aged 22, is married to Ellen (the pair are pictured below left) and living in St John's Road, Ryde, then part of the parish of Newchurch. He earned his living as a bricklayer. Later the same year he became the Town Crier after soundly beating off the competition in a 'shout-off' at the top of Union Street. According to the Press of the day his vocal-boom was said to have rattled windows all the way down to Pier Street. In the coming years he was appointed as keeper of the Town Hall, where he, Ellen and their many children set up home in the modest accommodation entered off Market Street, and added to his roles that of Town Sergeant. His stature and bearing was said to have suited the role perfectly. When Ryde Fire Brigade acquired a wheeled escape-ladder he was appointed to the role of Escape Conductor. His work in the town wasn't done yet as the mass of Victorian visitors to Ryde brought with it a mass of lost property so he set up and ran a lost-and-found office at the Town Hall. His work with the escape ladder was said to instill awe in the public and confidence in his men and he demonstrated rescues, carrying even the largest of the firemen down the ladder from the roof of the Town Hall "as though they were but a child". He was always first to leap off the roof of the Town Hall when it came to drilling with the 'jumping-sheet', which given his size was quite some feat both for him and for his colleagues who with white-knuckles leaned back and gripped the sheet below in Lind Street. By 1870 he was Captain of the Fire Brigade and went down in legend for command at his first fire. The Congregational Church in George Street burned so furiously that all thought the entire block would be destroyed but Buckett got his men aloft, despite taking a slate to the back of his helmet, and directed their water jets down into the burning mass and prevented any fire spread at all. A few years later he arrived first at a fire in Melville Street and rather than wait for his men ploughed in and dealt with the matter before they arrived. A London fireman visiting the Island witnessed his exploits at another incident at Quarr in 1879 and wrote to the local Press stating that Bucket was 'reckless' and had a 'complete disregard for his own safety'. Buckett appeared to be totally fearless, even of authority. On Saturday 3 June 1882 he was drilling his men in Lind Street when a disagreement in the Council chamber broke out in to fisticuffs. As the Town Sergeant he was summoned to intervene and in his own inimitable fashion had his men run a length of hose in to the Town Hall, up the stairs to the door of the chamber, which he promptly kicked open and proceeded to hose down the brawling Councillors. More incredible still is that the Councillors didn't fancy challenging the immense character over his actions and nothing more was said. Then there was the incident of Dr Hasting's cat. The cat had been scooped up and 'rescued' from the pavement by Borough Police Superintendent Hinks while Buckett and his men were in among the smoke and flames of Dr Hasting's 'Lansdowne House' in John Street. In the aftermath Hinks received a medal for 'bravery' from a humane society much to the chagrin of the firemen who'd actually removed the cat to safety. Then Dr Hasting's issued both Superintendent Hinks and Captain Buckett with £5 in appreciation of their efforts. Buckett shared his among his firemen whilst Hinks bought himself a marble clock. The firemen were furious, and no doubt some constables were too. Relations soured between the two organisations, exacerbated by an anonymous letter in the Observer by an unnamed member of the brigade, that thoroughly destroyed Superintendent Hinks' character. 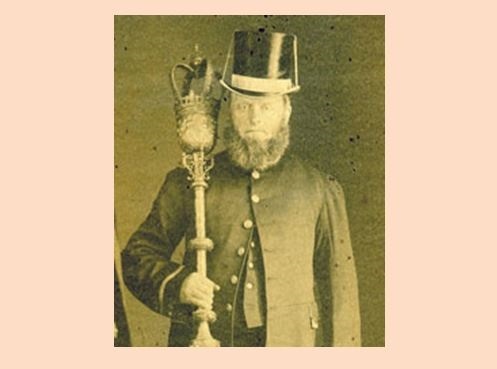 It was many years before a cordial relationship between the Fire Brigade and the Borough Police was resolved and to some extent Henry Buckett seemed to enjoy the challenge of affronting the police and continually getting away with it, as was his force of nature. Being an uncompromising man in a generally uncompromising era, even the Victorian borough was aghast at his comment made at the brigade dinner of 1885 that a major conflagration would be a good thing to 'rid the town of some its shanties'. But again no-one dared question him. Such a character was he that many local wordsmith's reflected his antics in the subject of poems and stanzas, many of which were published and which if anything, only served to imbue Bucket's own invincibility. Sadly in his fifties his health took a sudden, rapid and colossal downward turn. He was said to have been a shadow of his former immense physicality and he handed over command of the brigade to Charles Langdon in 1889. One writer alleges he wrote his will in chalk on the door of his Town Sergeant's office. Finally on Wednesday 3 June he passed away at home 2 Quarry Road, Ryde, with Ellen and (at least eight) children around him. Rest in peace Captain Buckett.